The series of storm systems beginning April 24 that tapped the brakes on a rapid snowmelt, as well as added a bit more SWE to the snowpack, is due to phase out by Tuesday. The last ten days of April precipitation favored the northern mountains, with Rabbit Ears SNOTEL seeing 3.6” SWE, Grizzly Peak near Loveland Pass gaining 1.2”, Scholfield 1.4”, Grand Mesa 0.6”, and Red Mountain Pass 1.0”. Some locations saw a decrease in SWE, such as Park Cone (-0.9”) and Wolf Creek (-1.2”). Major basins are now very near their long-term median SWE (98% - 113%), except for the Yampa & White River Basin which is ~89% of median. And, after the recent 7-day chill down many stream gauges are showing discharge near median levels (Uncompahgre, Animas, Taylor, San Juan at Pagosa, Rio Grande at Del Norte, Surface Creek near Cedaredge, Snake River, Fraser River, and Lake fork), while some are below median (Plateau Creek near Cameo, Yampa near Steamboat, Muddy Creek near Paonia), and a few are slightly above median (Colorado below Baker Gulch, Blue River near Dillon). Dust conditions across the state were described in the April 12 Update (http://www.codos.org/codosupdates/apr122017). The real problem dust events, D3 and D4, were located on the snow surface the middle two weeks of April. A few mild storms slightly buried the layer starting on April 20, then gradually buried it a bit more from additional snow accumulation the last 6 days of April. Currently, at Red Mt. Pass, the D3/D4 layer is located a few inches below the surface. Once snowmelt resumes the second half of this coming week, I would imagine D3/D4 will fully reemerge rather quickly after a day or two of nice weather, as well as other locations that received a bit of accumulation over the last 10 days. Starting Wednesday this week we will see return to the warm temperatures that have characterized long stretches of this years’ spring weather. Weather models are in good agreement and indicate that the next 5-10 days will deliver our warmest temperatures to date. Although uncertain, it is even possible that we will see a couple non-freezing nights up to 11,000 feet or higher over the weekend according to the GFS and NAM models. While the stormy end of April provided some new snow and a reset on the albedo of our dusty snow surface, it is unlikely this snow will cover D3/D4 for too much longer. Between the warm temperatures, the anticipated reemergence of these notable dust layers and an isothermal snowpack, we expect to see our weather to contribute to an increase in snowmelt and subsequent runoff downstream. The longer-term outlook suggests cooling temperatures following the weekend and the return of light precipitation in the beginning to middle of next week, although the timing, intensity and temperature (rain or snow and at what elevation?) of this precipitation are unknown. Forecasts this far out are still in the realm of “science fiction,” but as a general trend we should see some unstable weather with cooler temperatures towards the middle of May. The CODOS team will do another statewide tour May 5-7, and we will report our findings soon after. 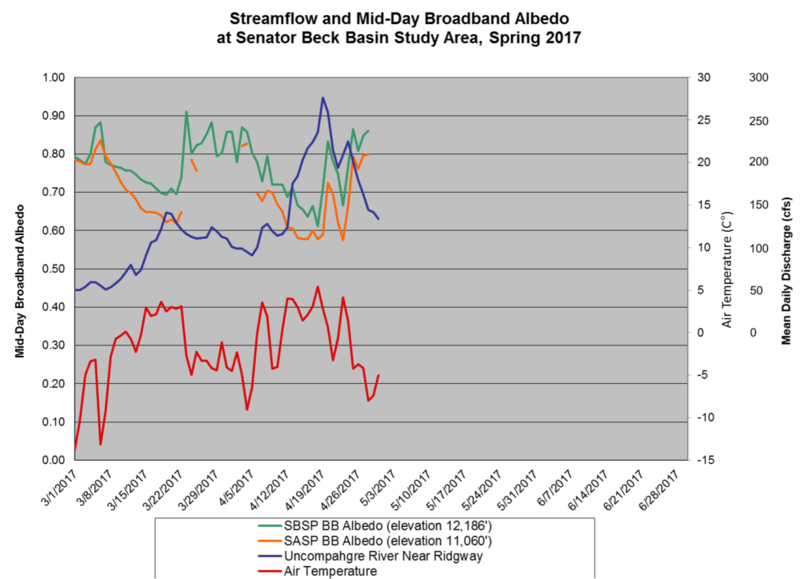 Multivariable (everything but the kitchen sink) plots above show SWE data along with median SWE values from SNOTEL stations, SWE values collected by the CODOS team at sample sites located near SNOTEL stations, stream discharge with median discharge in or near the SNOTEL’s watershed, date when the snowpack was observed to be isothermal, and dates and general location of dust layers in snowpack.